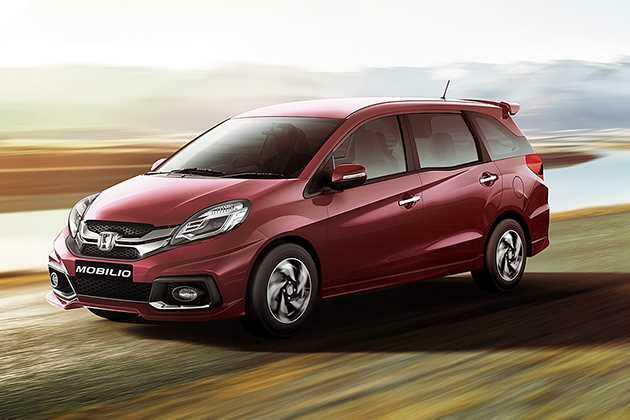 HCIL, one of the largest car makers has finally introduced their much awaited MPV, Honda Mobilio in the country's car market. The company has launched it with both petrol and diesel engine options in several variants. Among them, the Honda Mobilio E i DTEC is the entry level trim, which is equipped with a 1.5-litre engine. It has the ability to displace 1498cc, while producing 98.6bhp in combination with 200Nm. The braking mechanism is further assisted by ABS (anti lock braking system) along with EBD (electronic brake force distribution). The front and rear wheels are equipped with disc and drum brakes respectively. This variant is incorporated with almost all essential features like air conditioner with a heater, all four power windows, day and night inside rear view mirror and many other such features as well. At the same time, it comes with chrome plated radiator grille, body colored bumper,internally adjustable ORVMs and so on. At present, it is available in six exterior paint options for the buyers to choose from. The list includes Brilliant Gold Metallic, Carnelian Red Pearl, Majestic Blue Metallic, Urban Titanium, Alabaster Silver and Taffeta White finish. This variant is offered with a standard warranty of two years or 40000 Kilometers, whichever is earlier for attracting the buyers. The customers can also avail extended warranty at an additional cost to the authorized dealers. The company has given this multi purpose vehicle an attractive body structure, which is fitted with a number of features. To begin with the frontage, it is designed with a bold radiator grille, which has a thick chrome slat embossed with a prominent company emblem. This grille is surrounded by a radiant headlight cluster that is incorporated with halogen lamps and side turn indicator. The sleek bonnet has a few character lines and its windscreen is integrated with a couple of intermittent wipers as well. The body colored bumper has a wide air dam for cooling the engine. The side profile is designed with black colored door handles and outside rear view mirrors, which are internally adjustable. The neatly carved wheel arches are fitted with a sturdy set of 15 inch steel wheels, which are covered with 185/65 R15 sized tubeless radial tyres. The company has also given a full size spare wheel, which is affixed in the boot compartment with all other tools required for changing a flat tyres. On the other hand, the rear end is equipped with body colored bumper, a stylish tail light cluster, a large windshield with high mounted stop lamp and boot lid with variant badging, which gives it a complete appearance. The internal section of this Honda Mobilio E i DTEC variant is incorporated with well cushioned seats, which are covered with fabric upholstery. These seats provide ample leg space for all occupants and integrated with head restraints. The smooth dashboard is equipped with a few features like AC vents, instrument panel, a three spoke steering wheel and large glove box. The company has given it a lot of utility based aspects, which includes front seat back pockets, cup and bottle holders, ECO lamp, day and night internal rear view mirror, remote fuel lid opener, sun visors and many other such aspects as well. It has a 223 litre boot compartment, which can be increased to 521 litre by folding third row seat. Its illuminated instrument panel houses a digital tachometer, ignition key and headlamps on reminder, fuel consumption display and an electronic tripmeter. Its dual tone internal cabin is incorporated with silver finished instrument panel and central console, which gives it an elegant look. This variant is fitted with a 1.5-litre diesel engine, which comes with a displacement capacity of 1498cc . It is integrated with 4-cylinders and 16-valves using double overhead camshaft based valve configuration. It has the ability to churn out a maximum power of 98.6bhp at 3600rpm in combination with 200Nm at 1750rpm. This power plant is cleverly mated with a five speed manual transmission gear box, which sends the engine power to its front wheels. It allows the MPV to attain a maximum speed in the range of 150 to 160 Kmpl and it can accelerate from 0 to 100 Kmpl in about 13 to 15 seconds. With the help of common rail based direct injection fuel supply system, it can generate 23 Kmpl in the city traffic conditions. While on the highways, it gives close to 26 Kmpl, which is rather good for this segment. The front wheels are equipped with a set of disc brakes, while its rear wheels get conventional drum brakes. This braking mechanism is further enhanced by ABS along with EBD. On the other hand, the front axle is assembled with a McPherson strut, whereas the rear axle is fitted with torsion beam type of mechanism, which keeps the vehicle well balanced at all times. It is blessed with an electronic power steering system, which is tilt adjustable. This steering wheel supports a minimum turning radius of 5.2 meters, which makes it convenient for handling. Being the base variant, this Honda Mobilio E i DTEC variant is equipped with quite a few sophisticated aspects for the convenience of the occupants. The list of features include all four power windows with driver side auto down function, front windscreen in green tinted glass, tilt adjustable steering wheel and two interior cabin lights for the convenience. It also has an efficient air conditioning system, which comes with a heater. This variant is equipped with a number of protective aspects, which includes seat belts for all occupants with driver seat belt reminder notification on instrument panel, an engine immobilizer for preventing the vehicle from unauthorized entry and rear windscreen in integrated with a centrally located high mounted brake light. The company has given this MPV an ACE (advanced compatibility engineering) body structure, which enhanced the safety of the passengers sitting inside in case of any crash. 1. Efficient braking mechanism with the presence of ABS and EBD. 2. Spacious internal cabin with comfortable seating. 1. Engine noise and harshness can be reduced. 2. Too big in size for city roads.